Palestinian President Mahmoud Abbas (Abu Mazen) will give a widely anticipated speech during the UN General Assembly meetings in New York on 27 September, in which he is expected to announce the next move by the Palestinians in the light of the US administration’s bias towards Israel and its decision to ignore Israel’s continuing occupation of the West Bank and East Jerusalem and the violence it has been dealing throughout the Palestinian Territories. The speech coincides with the 25th anniversary of the Oslo Accords, which were hoped to lead to a permanent solution to the Palestinian-Israeli conflict and the creation of a Palestinian state. The anniversary is being marked by heated debates between those who defend the Oslo Accords for restoring the Palestinian cause and laying the foundations for the creation of a Palestinian state and the return of the Palestinian refugees to their homeland and those who condemn them for leading to the abandonment of 78 per cent of historic Palestine, the recognition of Israel and the giving of a free hand to Israeli occupying forces in the West Bank to continue settlement building and Palestinian economic dependency. Palestinian analysts believe that Abbas’s address in New York will be “critical” even though “nothing dramatic” will occur. They expect him to talk about the Israeli settlements, the repeated Israeli attacks on the Palestinians and the need to change Palestine’s status as an observer state at the UN to a fully-fledged member. Abbas is also expected to respond to decisions taken by US President Donald Trump, including on Jerusalem, the Palestine Liberation Organisation (PLO) and attempts to negate the Palestinian cause. Analysts note that progress in the stalled reconciliation talks between Fatah and Hamas, the largest Palestinian factions, would strengthen the Palestinian position on the world stage and make it more influential with the international community. After the Trump administration came to power in the US early last year, it took several decisions to undermine the Palestinian cause. It recognised Jerusalem as the capital of Israel and relocated the US Embassy from Tel Aviv. It suspended $300 million in funds to UNRWA, the UN agency responsible for the Palestinian refugees, stopped all financial aid to the Palestinian Authority (an estimated $200 million), and ended aid to Palestinian hospitals in East Jerusalem worth $25 million. On 10 September, the US shut down the offices of the PLO in Washington. On 16 September, it froze the bank accounts of the PLO and cancelled the visas of the family of Palestinian Ambassador to Washington Hossam Zomlout. They were asked to leave the US immediately even though their visas had been valid until 2022. Observers say that the most painful decision was ending the $300 million in funds for UNRWA which provide relief, health and education services to five million Palestinian refugees in the West Bank, Gaza Strip, Jordan, Syria and Lebanon. UNRWA, established 70 years ago after the creation of the state of Israel, is in dire financial straits and needs $200 million to keep its schools and health clinics open until the end of the year. Palestinian commentators said the US decisions were aimed at putting pressure on the Palestinian leadership to accept negotiations with Israel that exclude the issues of Jerusalem and the return of the refugees and uphold the Israeli settlements in the Palestinian Territories. They expect the Trump administration to continue such punitive decisions against the Palestinians because the Palestinian leadership has rejected the US peace plan, not yet officially announced, known in the media as the “deal of the century”. Leaked reports suggest the proposal ignores Palestinian rights, especially on Jerusalem, the refugees and settlements. The Trump administration announced in November last year that it would shut down the PLO office in Washington after Abbas called on the UN General Assembly to open a criminal investigation into Israeli actions in Palestine. The US State Department later said it would allow the PLO mission to continue working for a 90-day extension that would be renewed. However, it finally decided to shut it down on the pretext that the PLO had not begun “meaningful talks” with Israel. The US State Department said in a statement that the decision was due to concerns by the US administration and Congress about Palestinian attempts to launch investigations by the International Criminal Court (ICC) against Israel. Meanwhile, the White House said it was preparing a peace plan that Trump hopes will result in a “final agreement” between the Israelis and Palestinians. Jason Greenblatt, the US envoy to the Middle East, refused to commit to a timeline for this on his Twitter account, saying that the plan would not be unveiled at the UN General Assembly meetings in New York this month. The Palestinian leadership suspended all political contact with the US administration after the latter recognised Jerusalem as the capital of Israel in December 2017 and relocated the US Embassy to Jerusalem in May this year. Abbas has also frequently declared his rejection of Trump’s “deal of the century,” which he has said ignores Jerusalem and the Palestinian refugees and upholds the Israeli settlements. It underlines Israel’s dominance, he has said, even though Israel has refused to stop its settlement building or accept the pre-1967 borders as the basis for a two-state solution. In preparation for the UN meetings in New York, the Palestinian leadership met on Saturday in Ramallah to discuss its plan of action at the General Assembly, recent developments, and the US “deal of the century”, as noted in a statement by the PLO Executive Committee. Before the meeting, Abbas said the leadership would go to the UN to remind the world of the suffering of the Palestinian people and deliver a message on the US’s recent actions and Israel’s position. “There is evidence that Israel could decide to allow Jewish prayers at the Al-Aqsa Mosque in Jerusalem. It wants to repeat what happened at the Ibrahimi Mosque [in Hebron on the West Bank],” Abbas said. Israel, which occupied Jerusalem in 1967, allows Jews to visit the Al-Aqsa Mosque as part of a programme of mosque tourism. Abbas added that the Palestinians would continue to urge the ICC to prosecute Israel for its crimes, noting that a case was referred to the ICC a few days earlier regarding Israel’s decision to demolish the Bedouin village of Al-Khan Al-Ahmar in the area of Occupied East Jerusalem. The case would also be referred to the International Court of Justice (ICJ), he said. 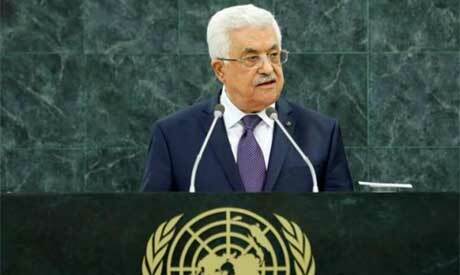 Abbas will travel to several countries before arriving in New York to attend the General Assembly. Palestinian sources said he wants to rally Arab and international support for the Palestinian cause and against recent moves by the US administration, adding that the Palestinian leadership is looking into fast-tracking the implementation of “political plans” in cooperation with Arab and foreign parties and international agencies to confront decisions by Washington and Tel Aviv. Palestinian Foreign and Expatriate Affairs Minister Riyad Al-Maliki told Palestinian television that the leadership could take various steps in response to the US decisions. He said it had approached the ICJ and filed a complaint against the US for relocating its embassy to Jerusalem. “We will see more recognition for our state by more countries on multiple continents,” Al-Maliki said, referring to Colombia’s recent recognition of Palestine. Al-Maliki added that in his speech to the UN General Assembly Abbas would focus on relations with the US administration, Israeli actions on the ground and internal Palestinian affairs including reconciliation with Hamas. “The president will visit Paris for talks with French President Emmanuel Macron on holding regular peace conferences that France will host,” he said. Abbas will also visit Ireland to discuss ideas for peace, after which he will fly to New York and hold meetings with other world leaders.